Background: Maxillofacial injury has been described in the medical literature as early as 2500 BC. Although, these injuries appear very fearsome. They cause menace to life only, if they obstruct the airway. This is of utmost concern to the anesthetist, because of their closeness to the airway. Patients and Methods: A retrospective study of patients who underwent surgery for facial fractures within the period of 10 years in a Nigerian tertiary health care facility. Results: There were 264 cases of facial fracture with panfacial fracture, i.e., 123 cases (46.6%) constituting the bulk. The majority, i.e., 187 (70.8%) were male and the mean age was 33 years. Nasotracheal intubation (213 [81.5%]) was the technique widely used followed by orotracheal intubation (41 [15.5%]). The majority of the patients, i.e. 145 (54.9%) was Mallampati III and had advanced airway management. Most of our patients had the American Society of Anesthesiologists II, complications occurred in only 6% of patients. Conclusion: Nasal intubation was the preferred mode of intubation by the maxillofacial surgeons and the anesthetists. The mechanism of injury and amount of energy transfer should give a clue to both surgeon and anesthetist of the severity of injury and airway embarrassment. A percentage of facial trauma patients may need early intubation before bleeding and swelling hamper ventilation. Intraoperative maxillomandibular fixation frequently requires nasotracheal intubation. When nasoorbitoethmoidal fractures coexist with mandibular fractures, the nasotracheal tube interferes with operative correction. Tracheostomy and intraoperative exchanges between naso- and oro-tracheal intubation have habitually been used in this group of patients, yet surgeons have sought other methods to avoid the associated morbidity of these maneuvers. Submental and retromolar intubation maintain oral and nasal access while simultaneously avoiding tracheostomy., Moreover, nasal intubation is contraindicated in fracture of the base of the skull. Postoperative management of patients with maxillofacial trauma emphasizes avoidance of reintubation of the difficult airway. During the fixation of maxillomandibular fracture, precautions should be taken to avoid accidental extubation of the endotracheal tube. Thus, respiratory parameters and close monitoring of these patients are absolutely necessary. Efforts at eliminating difficult airway reintubations have led some anesthesiologists to use pediatric airway exchange catheters after extubation. A search in the literature does not reveal any write-up from this part of the world dealing with the anesthetic management of maxillofacial trauma patients. 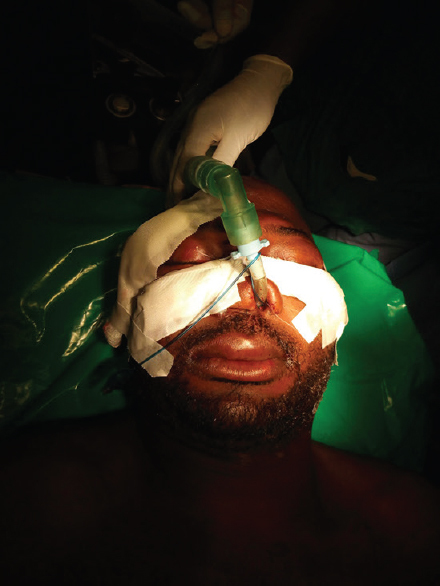 The aim of this article was to retrospectively analyze the techniques of airway management in maxillofacial trauma patients seen in a Nigeria tertiary health institution. We present a retrospective theater registers and anesthetic chart reviews of 264 cases of maxillofacial surgery trauma, treated over a period of 10 years (2006–2015) in Ahmadu Bello University Teaching Hospital Zaria, Nigeria. After obtaining ethical approval from the hospital ethics committee, with approval number ABUTH/PGO/COMM/9, the preanesthetic assessment record of each patient was retrieved and reviewed by the research team. Usually, the decision for the intubation technique was based on airway assessment by Mallampati classification, thyromental distance, and atlantoaxial mobility as a part of documentation in the preanesthetic review. Routine monitoring, in the form of noninvasive blood pressure, pulse oximetry, and electrocardiography were usually instituted on arrival in the operation theater. From the patients' records, each patient had premedication with intravenous atropine 10 mcg/kg on the operating table. Data collected for the study were all facial fractures, patient's gender, age, preoperative hemoglobin value, and airway management techniques. Patients whose airway assessment revealed Mallampati I or II were considered adequate for conventional laryngoscopy and intubation. For those patients in whom Mallampati assessments were III and IV, assessment of anticipated difficult airway was made, and these patients had fiberoptic intubation or surgical tracheostomy. Conventional intubation was defined as orotracheal/nasotracheal intubation with the aid of laryngoscope only while advanced intubation involves the use of laryngoscope and other airway adjuncts (lighted stylet, gum elastic bougie, fiberoptic laryngoscope, and tracheostomy). Anesthesia was induced with 2.5 mg/kg of propofol; intubation was facilitated with succinylcholine 1–2 mg/kg and maintained with nondepolarizing muscle relaxants (pancuronium or atracurium), oxygen, and halothane/isoflurane. Analgesia was opioids (pethidine, morphine, or pentazocine). End-tidal carbon dioxide was monitored with mainstream capnograph. Adequate hydration was ensued in all the patients with crystalloids. At the end of the surgery, residual effects of nondepolarizing muscle relaxant were reversed with a mixture of neostigmine 80 mcg/kg and atropine 20 mcg/kg given intravenously. Extubation was carried out with the patients fully awake, breathing spontaneously, obeying commands, and who have satisfactory muscle power. For those who had blind nasal intubation, the intubation was established with tracheal mucosa anesthetized with 2–3 ml of 2% lidocaine injected through cricothyroid membrane. The needle was withdrawn immediately, and the coughing of the patient led to spread of local anesthetics over tracheal mucosa and vocal cords. An appropriate-sized and well-lubricated endotracheal tube was then introduced through the nostril into the pharynx. Thereafter, breath sounds guided the insertion of endotracheal tube into the glottis. Manipulations were needed in the most cases by way of flexion of the neck and extension at atlantoaxial joint. Cricoid pressure was employed for the stabilization of larynx. This maneuver helped in the correct endotracheal intubation. All patients had their throat packed with wet gauze. [Table 1] summarizes the cases of maxillofacial fractures, gender, and age. It revealed that one of the major cases patients suffered from was facial fractures, 27.7% (264 cases of a total of 956 maxillofacial surgeries done in our center during the study period). Considering the gender, it was observed that the cases of facial fracture were predominant in male patients with 70.8% (187) while it was less in female patients with 29.2% (77). The preoperative hemoglobin was found at a mean value of 12.6 ± 2.2 g/dl with patients' age mean of 33.1 ± 11.4 years. [Figure 1] presents the Mallampati classification. 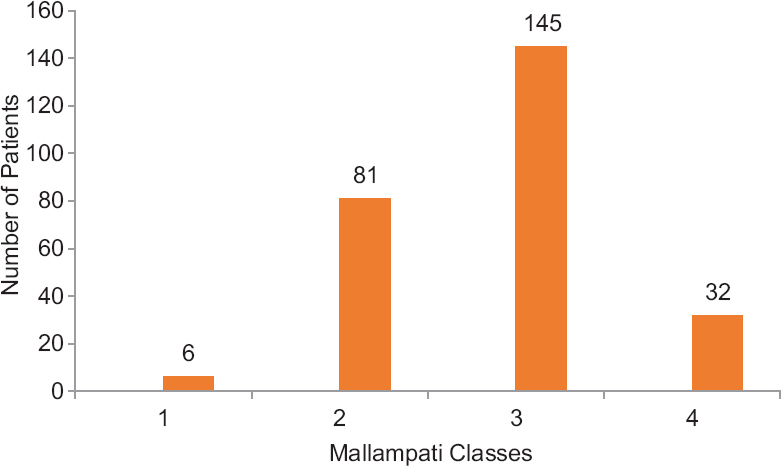 Results indicated that Mallampati classes I, II, III, and IV were 6 (2.3%), 81 (30.7%), 145 (54.9%), and 32 (12.1%), respectively. 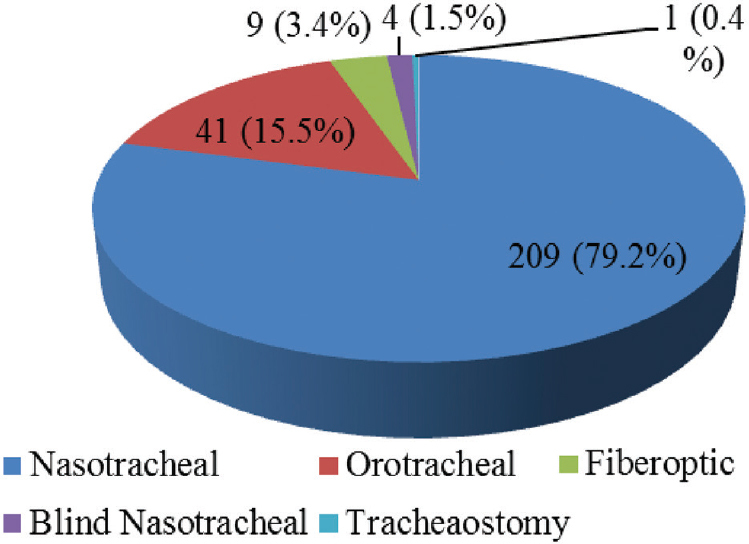 [Figure 2] shows that of the 264 participants studied, the majority of the patients, i.e., 209 (79.2%) were intubated using nasotracheal intubation (picture of a case treated is shown in [Figure 3]), followed by orotracheal intubation – 41 (15.5%), fiberoptic intubation – 9 (3.4%), blind intubation (passage of endotracheal tube through the nose into the trachea) – 4 (1.5%), and tracheostomy – 1 (0.4%). The airway management techniques showed conventional intubation technique of 166 (62.9%) while advanced intubation technique was 98 (37.1%). The observed complications of anesthesia in facial trauma cases were as follows: significant blood loss – 2 (0.8%), oculocardiac reflex – 2 (0.8%), damage or blockage of the endotracheal tube – 4 (1.5%), and delayed recovery – 5 (1.9%). Therefore, of the 264 patients, only 16 patients (6%) had complications. Trauma is an epidemic of the twenty- first century and accounts for thousands of deaths every year. It is of even more importance to society as young productive lives are involved. Patients having maxillofacial injuries with or without cervical spine fractures and head injury need securing of airway by the anesthetists and surgeons. Advanced Trauma Life Support protocol must be followed in all cases of maxillofacial trauma and associated injuries addressed according to the priority. Maxillofacial trauma leads to varying degree of compromised airway and presents a major challenge to anesthetists, who need to use all their skills and expertise to reduced morbidity and mortality., In this study, it accounted for 27.7% of all cases operated under general anesthesia. This study presented more male than female in the ratio of 2.7:1 (M:F) while the mean age was 33.1 years (11.4 standard deviation). The ratio obtained from our study is similar to a previous findings. This male dominance reflects commuters in our country and expresses the probability of exposure of male to high-risk jobs that could lead to facial injuries. The mean hemoglobin value (g/dl) was 12.6 (2.2). This is important as significant blood loss has anesthetic implication in terms of hemodynamic stability leading to morbidity and mortality. Criteria such as thyromental distance, interincisor gap, and atlantoaxial mobility may be used to assess the level of anticipated difficulty in airway management; these criteria, however, have their own shortcomings and none of these were routinely done in our center. Hence, they were not considered for this study. Routine throat pack is practiced in our center for patients scheduled for maxillofacial surgeries, including the trauma cases; this is to prevent soilage of the lungs and the stomach by blood and debris. This agrees with Athanassoglou et al. 2018. They also stated that it gives some degree of stability and security of the tracheal tube. The technique utilized is dependent on the judgment and experience of the anesthetists while the choice of the airway control in patients with cervical spine fracture differs between anesthetists and surgeons; the available methods should be safe, effective, and acceptable. Nasotracheal intubation is the gold standard in oral and maxillofacial surgeries as it provides a good field of operation, especially in trauma where there is need for intermaxillary fixation in reduction and immobilization of fractures. In this review, 81.5% were intubated through nasotracheal intubation which was higher than the 66.6% documented by Chauhan and Acharya. This technique is contraindicated in patients with nasal complex fractures and those with base of the skull fracture. Where there is anticipated difficult airway, blind nasotracheal intubation may be attempted. Weitzel et al., 2004, reported the success rate of 90% for prehospital intubation using the blind nasotracheal method in penetrating neck trauma. However, backup plans for failed conventional techniques of intubation are mandatory. This technique was used in 1.5% of cases in our study, unlike Smoot et al., 1997, who in a survey reported that >50% of the respondents chose some form of nasotracheal intubation (blind or fiberoptic) for fracture patterns involving the midface. This could serve as a guide for carrying out nasal intubations in maxillofacial fracture cases. However, submental intubation is preferred in the presence of CSF rhinorrhea, where an incision is made at the submental region into the oropharynx. Then, the patients would have endotracheal intubation through the submental opening. Awake blind nasal intubation can be done in other circumstances where the above complications are not a problem; however, this needs patience on the part of anesthetist and high degree of cooperation from the patients. Orotracheal intubation in this study accounted for 15.5% of all cases which was lower than the 30.3% in Brazil. This was routinely used for those cases where intermaxillary fixation was not needed such as nasal complex, naso-orbitoethmoidal, and zygomatic complex fractures. Recent advances in anesthesia include the use of Airtraq and Macintosh laryngoscope in the management of difficult airway commonly encountered in maxillofacial surgeries. Fiberoptic bronchoscope-assisted intubation is the safest and most certain method of ensuring nasal or oral intubation, as it confirms the placement of endotracheal tube in the trachea. In our review, 3.4% were intubated through this technique, and they were basically cases of panfacial fractures. The use of ultrasound-guided intubation is an evolving technique in the anesthetic management of the anticipated difficult airway, likewise the use of fluoroscope in endotracheal intubation, especially in anticipated difficult airway. This is not a practice in our center due to low-resource setting in the facilities. However, this is an area of research in the future. Surgical airway should be reserved for patients with severe injuries or failed intubations. In this study, tracheostomy accounted for 0.4%. Tracheostomy is preferable where other intubation techniques fail. In a recent review, submental intubation has been found to be safe but observed increased tracheal pressure as a result of deviation and compression of tube. Since we did not have any experience in these techniques, it was not considered. Furthermore, submandibular intubation has been carried out. Postoperatively, patients are usually extubated in the ward when fully awake by the surgeon. Wire cutters and wire twisters are usually available in the ward for emergencies. This agrees with the available literature,. Of the 264 patients that had surgery, few complications were noted. These included oculocardiac reflex (0.8%), reflex bradycardia (1.1%), damage or blockage to the endotracheal tube (1.5%), and significant blood loss (0.8%). These complications and some others have been reported in the literature. Maxillofacial surgery trauma presents with difficult airway. Nasal intubation was the preferred choice of intubation by the maxillofacial surgeons, providing them with free access to operating field, and fiberoptic bronchoscope provided the most definite placement of endotracheal tube in our center. Surgical tracheostomy is the last option in securing the airway in maxillofacial trauma. Alternative techniques such as submental, submandibular, and retrograde intubations need more expertise but can provide efficient airway control. Morosan M, Alan P, Nicola C. Anaesthesia and common oral and maxillo-facial emergencies. Br J Anaesth 2012;12:257-62. Tuckett JW, Lynham A, Lee GA, Perry M, Harrington U. Maxillofacial trauma in the emergency department: A review. Surgeon 2014;12:106-14. Rhee KJ, Muntz CB, Donald PJ, Yamada JM. Does nasotracheal intubation increase complications in patients with skull base fractures? Ann Emerg Med 1993;22:1145-7. Athanassoglou V, Patel A, McGuire B, Higgs A, Dover MS, Brennan PA, et al. Systematic review of benefits or harms of routine anaesthetist-inserted throat packs in adults: Practice recommendations for inserting and counting throat packs: An evidence-based consensus statement by the difficult airway society (DAS), the British Association of Oral and Maxillofacial Surgery (BAOMS) and the British Association of Otorhinolaryngology, Head and Neck Surgery (ENT-UK). Anaesthesia 2018;73:612-8. Lord SA, Boswell WC, Williams JS, Odom JW, Boyd CR. Airway control in trauma patients with cervical spine fractures. Prehosp Disaster Med 1994;9:44-9. Chauhan V, Acharya G. Nasal intubation: A comprehensive review. Indian J Crit Care Med 2016;20:662-7. Weitzel N, Kendall J, Pons P. Blind nasotracheal intubation for patients with penetrating neck trauma. J Trauma 2004;56:1097-101. Smoot EC 3rd, Jernigan JR, Kinsley E, Rey RM Jr. A survey of operative airway management practices for midface fractures. J Craniofac Surg 1997;8:201-7. Maharaj CH, Costello JF, Harte BH, Laffey JG. Evaluation of the airtraq and macintosh laryngoscopes in patients at increased risk for difficult tracheal intubation. Anaesthesia 2008;63:182-8. Das SK, Choupoo NS, Haldar R, Lahkar A. Transtracheal ultrasound for verification of endotracheal tube placement: A systematic review and meta-analysis. Can J Anaesth 2015;62:413-23. Reier CE, Reier AR. Radiologic-assisted endotracheal intubation. Anesth Analg 2004;98:1496-8. Walls RM. Airway management. Emerg Med Clin North Am 1993;11:53-60. Caubi AF, Vasconcelos BC, Vasconcellos RJ, de Morais HH, Rocha NS. Submental intubation in oral maxillofacial surgery: Review of the literature and analysis of 13 cases. Med Oral Patol Oral Cir Bucal 2008;13:E197-200.